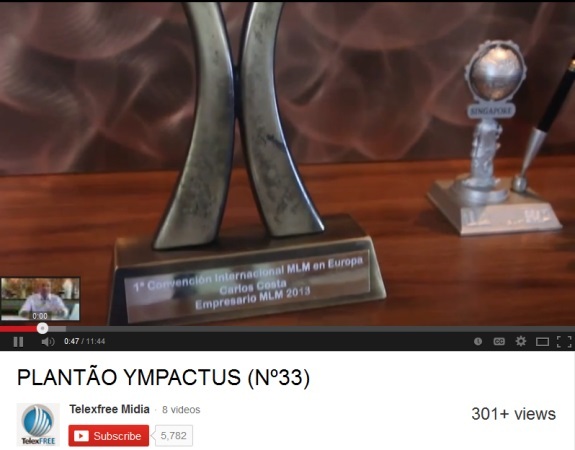 UPDATED 9:46 P.M. EDT (U.S.A.) The video below of TelexFree executive Carlos Costa is in Portuguese. In this particular circumstance, the Google facility to translate captions from Portuguese to English didn’t do much to aid our comprehension. Perhaps one of our readers skilled in both Portuguese and English could provide a summary below of Costa’s remarks. It would be appreciated. Jornal.US News Service has a story here (in Portuguese) that references the video. The Portuguese translation by Google of the article says TelexFree has been subjected to a penalty by a Brazilian tax authority of “70 million reais.” That’s about $30 million (U.S.). We are treating this information as nonfinal, which means we may update/amend this PP Blog post as the circumstance becomes more clear and more information becomes available. If the penalty sum is accurate, it’s hard to see how this is good news for TelexFree reps, particularly amid Ponzi/pyramid concerns elsewhere about TelexFree. That’s because Ponzi/pyramid schemes already are under financial stress before taxation even is taken into consideration. Beyond that, TelexFree has been tinkering with its compensation plan. Given the tax circumstance, questions now can be raised not only about whether TelexFree is engaging in the sale of unregistered securities in many countries, but also whether the compensation tinkering is designed somehow to minimize cash outflow by making it harder for members to qualify to get paid. News of the tax penalty comes only days after TelexFree charged affiliates $164 to attend a function in Boston. At the Boston event, a man selling a TelexFree-related credit-repair program talked about being on a “private jet” with others in TelexFree and flying from the Dominican Republic to Haiti. Separately, BehindMLM.com is reporting that TelexFree has been banned in Rwanda. Come on SEC! You’ve been investigating TelexFree since last year. USE YOUR BAN HAMMER! BAN THEM! On the last call Telexfree president Carlos Costa Ympactus Commercial LTDA says he is happy to pay a fine in the amount of R $ 71,616,397.58 with the credit that he owned in Federal revenue representing 75 % of the 150 % value that would be applied by organ. ” We also took the liberty of taking on the payments already made federal revenue counter. We pay what we had and so did credit the payment of this fine millionaire ” Costa says happy in the video because he said the IRS found no inregularidade in Ympactus . ” Let’s not waste time the IRS took 9 times to analyze it . ‘s Acre MP you are trying to analyze the same books , we’ll wait what ? 9 months ? 6 months? Company or that lightning will be to do this? . ” Esbrafejou noting that the company wants to return the money that had no return on the investment in Brazil . Finishing the express video also to that popularizers ” company is honest and fulfills the obligations . ” Costa extended the appeal playing the subject being discussed in the public hearing to be held at Acre on June 21 , in the chamber of the state Legislature , forgetting that the event will be promoted to discurtir rulemaking MMN and not unlocking companies in the sector . Today in Brazil there are thousands of companies that pay their taxes properly and fulfill its obligations as a legal institution but not to say that these are due to the lawfulness comply with tax obligations , but discovered that after illicit activities are called ” legal bandits ” a clear example is the drug trade itself. * Following but once appeals to the prosecutor of Acre to release money locked so that the company can pay those who invested and not citing who had return. Thank you, Gil. That provides some context on Costa’s take. Well, the only reason they had to pay it is because they were under micro business regulations and tax bracket, when they should have applied for a change to big business regulations and tax bracket after the company boomed in Brazil. But in Brazil you can only change the status of a company at the beginning of the fiscal year.